Ted Kemp celebrating his 80th birthday in style after being congratulated for being the longest serving paper boy in Norfolk. Ted has been bringing the news to people around Great Yarmouth for 70 years in a business which he runs from his garage. and while younger paperboys may come and go on their flashy mountain bikes Ted remains a familiar face to hundreds of customers as he makes rounds on his sturdy trade bike. 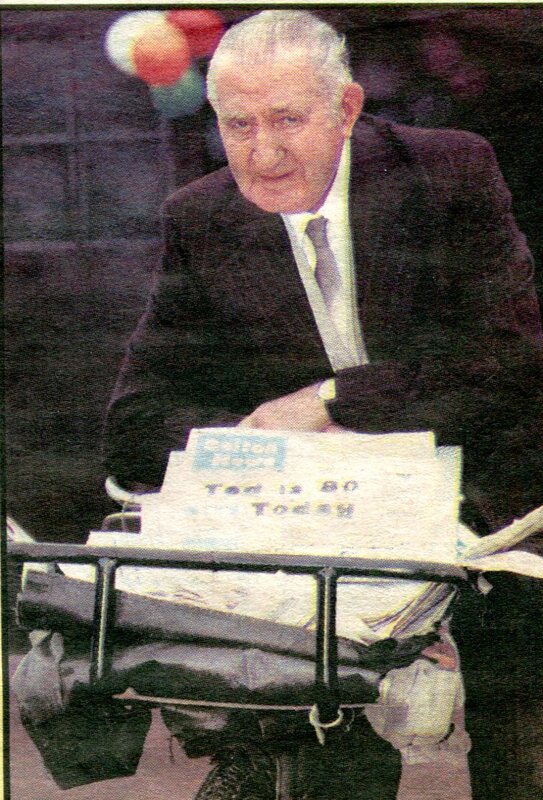 Ted of St. Johns Road, Belton started delivering papers at the age of 10 when he helped his father loading up his pony and cart and riding around the villages to deliver the news. He gradually took over the family business, which has been going for almost a century in 1993 and brought in bicycles to deliver the papers – he would have often clocked up about 25 miles a day. “You get to know all the customers” Ted said. “You share in all their joys and sorrows.” For the 70 years Ted had the round he used to get up at 04:30. to start work and had never taken a days holiday. Ralph Childs, chairman of the Yarmouth branch of the National Federation of Retail Newsagents, said Ted was one in a million. “He puts younger people to shame. As far as we know Ted is the longest serving paperboy in the county, possibly the country”.